Thanks for visiting the SD Performance website. SD Performance was founded in 1996 by Dave & Lisa Bisschop. Dave was introduced to the Pontiac hobby by his brother Bill at a young age and hasn't looked back. Like all us Dave wanted more then just a stock engine, so he began experimenting with different camshafts, intakes etc. as well head porting on basic stock type engines. After completing a frame off restoration on Dave's 69 Judge in the early 90's Lisa decided to turn her 65 GTO into a drag car, Dave didn't argue. While Dave knew his way around the stock type Pontiac engine, building a serious race engine was a new challenge. After meeting Pete McCarthy in 1992 a friendship developed and Pete with his generous personality to share his hard earned knowledge, helped steer Dave and Lisa in the right direction and even ported their first set of race heads for no charge. Pete also shared his knowledge on cylinder head porting, which helped Dave to fine tune his own porting skills. After Lisa's GTO was up and running, Dave began helping other Northwest Pontiac Enthusiasts improve their cars performance with ported heads, camshafts and complete engines. As time went on the demand grew and a fulltime business was beginning to evolve. With the help of Jim Butler SD Performance was able to offer high quality parts at competetive prices. Dave credits Jim Butler with a lot of guidance on business matters in those early years and still has a ton of respect for the Butler organization. In 1997 Dave, Lisa and their son Zac moved to CA, where with the help of Pete and Jane McCarthy set up a fulltime business. In 1999 the family moved back home to BC and with the help of their new business partners Jim and Barb Neville set up a larger facility. Seven years later in 2006 one of SD Performance's best customers, Marcel Konings approached Dave & Lisa about getting involved with the business as he was wanting out of his current business and being a diehard Pontiac performance nut (this is an understatement) with proven business background felt he could look after the weak areas of the business such as business management and customer service and allow Dave to focus on what he does best namely porting heads, developing better engine combinations and building complete engines. Jim and Barb Neville also felt that this could be a great opportunity for SD Performance to grow and a deal was struck and they sold their shares to Marcel and his wife Tanya. Dave and Lisa had been looking into CNC head porting for a few years and now with Marcel's business expertise and financial backing the dream became a reality in Sept. 2006, SD Performance's goals with the CNC machine is to offer a better product at a fair price with greatly improved turn around time. The mission at SD Performance hasn't changed, friendly individualized service before and after the sale with awesome products and a constant pursuit of MORE POWER!! at a very competetive price. 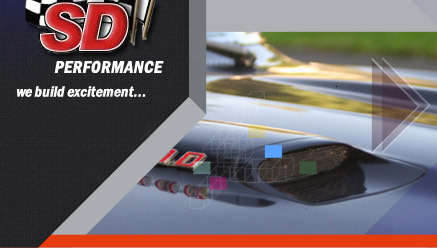 SD Performance also believes in working with other Pontiac specific engine builders to help bring and develop more and better products to market after all this is our hobby as well and by working together we can all accomplish more which continues to make this Pontiac Performance hobby grow. All of us at SD Performance would like to thank all our loyal customers/friends for their continued support, without it we wouldn't be here.